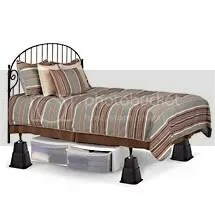 The day I finally broke down and bought bed risers was a turning point in my marriage bed. My husband will tell you the same thing. WOW! What a blessing they have turned out to be! These are the bed risers that we bought. We have a king sized bed, so I had to buy two packs of them. They give you the choice of raising your bed 3 inches, 5 inches, or 8 inches. Since we already had a relatively new set of extra deep mattresses with an extra pillow top, we didn’t need the full 8 inches. We opted for 5 and it has been wonderful! I will note here that Amazon has some cheaper, butI do not know about the quality. It also looks like they are just one size and you don’t get the three different options like the ones I got at Walmart. Bed risers have raised us up so that we can now see ourselves when we are making love, in my large dresser mirror. They have also made it so that my husband can stand beside the bed and give me a body massage without feeling like he is breaking his back! (And yes, I give as well as receive!) And finally, they have enabled us to experiment with new positions that we couldn’t do before. If I lay on the bed and he stands on the floor beside the bed, his privates meet mine nicely! So I just thought I’d take a minute to make this recommendation to all you readers out there. It’s a relatively inexpensive way to really add some spice to your lovin! I give our bed risers five pepper hearts! !